One of the things that I noticed about the materials I used last time I taught Korean history1 is that the texts I chose for my course did not mention, much less discuss in depth, the recently departed Moon Sun Myung‘s Unification Church. The global reach of this uniquely Korean Christian sect would seem to make it a natural topic for discussion, but even works that look in some detail at the religious changes of modern Korean history didn’t address this sect. The absence was so striking, that I started to wonder if there was some sort of political minefield or cultural taboo at work, or if I had grossly misunderstood the scale and impact of the movement. I haven’t been looking all that hard for answers one way or the other in the two years since, but I certainly would like to have some better sense going in this time. I’ve been thinking again about the broader issue of beginning to approach the South Korean post-colonial state and post-1945 medicine, recognizing the immense problems that this presents. k) The incremental growth / provision of national health insurance (1963-1989). 1) Lots of continuity / overlap with previous forms of Japanese practice, especially in public health terms, that is, the large-scale mobilizations of 1960′s and 1970′s (FP, Anti-Parasite eradication). 2) Immense effort to link personal health to national welfare as related themes, especially with international aid in post-Korean War period, but even into the 70′s and 80′s. More on this later, and for now, just recognizing the immense complexity of one little slice of time on these issues. I don’t work on the colonial period, but I suspect it’s equally complicated on issues of medicine / health, far more complicated than some would have it. Just a quick note, even as the Japan situation continues to unfold, to recall that (1) the current ROK government wants to prioritize nuclear exports in the coming years; and that (2) the domestic industry provides a significant portion of the nation’s energy (28 plants either in operation or under construction). At this point, it would be unfair to make any sweeping generalizations or loose analogies with the Fukushima site, but it is not unfair to recognize similar types of actors (General Electric) and contractors dating to the late 1970′s, in roughly the same part of the world, and to ask some hard questions about those plants and their lifespans. More on this later, but I have been surprised (although I suppose I should not be) about the press coverage from Japan, much of which has focused on TEPCO, and very little of it looking at the reactor origins and hardware. Seungsook Moon at Japan Focus has an interesting historiographical essay about the contested life and legacy of Park Chung Hee, who led Korea through the 60s and 70s. The debate is particularly interesting because it parallels discourses which are ongoing in other post-dictatorial societies, including the debates about Stalin in Russia, Mao and Deng in China, Chiang Kaishek in Taiwan, etc. The history itself is fascinating, though I do wish Moon had spent a little more effort mediating some of the factual basis for the competing narratives. I remember the shocked look on my students’ faces fifteen years ago when I told them that we actually had no idea how decisions were made or leaders picked in North Korea, that it was more or less still a “black box.” I find it fascinating that we’re starting to get a better public picture of the internal processes of North Korea. One of the reasons is the steady stream of refugees. In the Financial Times, Matthew Engel reports on a Korean enclave in the SW London suburb of New Malden. The relatively closed and self-reliant society is mostly middle-class, “bourgeois,” but among “the beginnings of an underclass” are North Koreans. I get the impression from the article that many of them are illegal immigrants, and their “underclass” status comes both from their lack of professional skills and their desire to remain outside of official notice. In the political realm, it called for chaju (independence), in which North Korean leaders governed without constraint from outside pressure or internal challenge. Economically, juche called for charip (self-sustenance), which required a largely self-contained economy based on domestic workers using domestic resources to satisfy domestic needs. In international relations, juche advocated chawi (self-defense), a foreign policy based on complete equality and mutual respect between nations as well as the right of self-determination and independent policymaking. 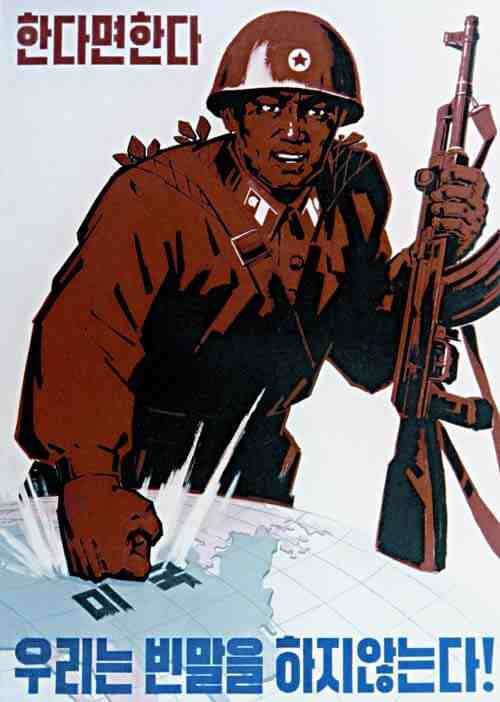 Juche, simply, demanded the people subordinate themselves to the state, and the state in turn would advance their collective interests in accordance with the uniqueness and majesty of Korea, and always in pursuit of greater economic, political, and international independence. By justifying the position of the suryong (single leader) and uniting the people behind him, juche successfully advanced Kim’s interests. I’d call that a fairly textbook kind of fascism: emphasizing the independence of the nation, the subordination of the people to the nation, and the fuhrerprincip — the leader who embodies sovereignty. Even the reliance on the US as a hobgoblin echoes the “we have been denied our rightful place in the world” rhetoric of the early 20c fascist regimes. The only thing that distinguishes North Korea from them, really, is the longevity of the Kim dynasty. The Kim refered to in the above excerpt is Kim Il Sung, the founder of the DPRK; his son, Kim Jong Il, is one of the only examples I can think of of a successful fascist succession. However, by closely associating the government’s legitimacy with its successful pursuit of juche, Kim had opened the door to potential disaster. When he triumphantly achieved juche, North Koreans would perpetuate and even embrace his rule. But if the pursuit was unsuccessful, the most fundamental justification for the regime would appear violated. Legitimation of a government is always a double-edged sword. Some forms of legitimation have a sharper back edge than others: the Confucian Mandate of Heaven is like this, as well. When considered within this framework, Kim’s tendency to behave more aggressively when he seemed to be at his weakest makes sense. Unable to deny economic and political instability that suggested his government was not acting in accordance with juche principles, Kim redoubled his efforts to demonstrate his strength and independence in the third juche realm, foreign policy. He does a nice job fitting the periods of economic trouble with the eras of international tension. He also does a good job illustrating the claustrophobic environment — the limited, controlled media, the cradle-to-grave indoctrination, the purges, etc — which makes North Korea such a surreal place. There was a time in Korean labour movement history in the 1970s when it were the female workers who actually led the most militant part of the struggle. The reasons were obvious – while the wages were held generally low and grew on much lower rate than the economy as the whole (in the 1960s, the growth rate for economy were whopping 10%, but for real, inflation-adjusted wages in the manufacturing – modest 2,4% on the annualised basis), the female wages were always lower than the male ones, and military-like systemized bullying on the part of the male supervisors used to make factory life a miserable, constantly humiliating experience. Accordingly, some of the most moving struggles of the 1970s took place on the female-dominated textile factories – KyOngsOng Pangjik (1973) and Tongil Panjik (1978) strikes being the best known ones. In the latter case, the striking female workers were eventually assaulted by their male colleagues (? ), beaten and showered with human excrements. Their response? On the Easter, 1978, they came to the public worship place on YOUido Square and succeeded in taking microphone for 5 minutes and shouting to the city and world – “우리는 똥을 먹고 살 수 없다!”. Of course, more beatings and arrest followed immediately, but the phrase ended becoming a tale-telling slogan of the female labour movement. On March 1, 2006, approximately four hundred women who work as train attendants (similar to flight attendants) on the KTX “bullet train” began a strike to demand the end of discriminatory and unjust outsourcing practices of the Korea Railroad Corporation (KORAIL). Despite KORAIL’s promise that workers hired under short-term contracts via an external company would be granted permanent status as direct employees of KORAIL after one year, the KTX Crew Workers Branch Union’s demands for direct and permanent employment have yet to be met. To date, the KTX Crew Workers’ Branch Union’s struggle is the longest and most bitterly waged fight by women workers in the history of Korea. For over 500 days, women who work as train attendants on the KTX bullet trains have held public rallies and marches, occupied buildings, lectured in classrooms, and conducted outreach on the streets and at train stations throughout the country. KORAIL’s continued refusal to meet the union’s demands for gender equality, safe working conditions and secure employment have led union leaders to engage in desperate measures to expose the unjust and unequal conditions under which they are forced to work. After exhausting every tactic, 31 union members began a hunger strike on July 2, 2007. As the hunger strike surpasses its 14th day, many union members have been rushed to the hospital.. Despite KTX’s sleek and high-tech image as the fifth fastest “bullet train” in the world, it is the site of blatant sexism and labor abuse. Of those train attendants who are irregularly employed under outsourcing agreements, the majority are women. In contrast, their male counterparts who perform comparable duties are directly employed by KORAIL as “team leaders.” Simply by being women, KTX train attendants are subject to lower wages, harsher working conditions, and heightened job insecurity. In addition, women workers face the perpetual threat of dismissal if they speak out against unfair conditions and sexual harassment in the workplace. According to the National Human Rights Commission of Korea, KORAIL’s treatment of KTX female train attendants is a clear example of gender discrimination and a basic violation of human rights. The National Human Rights Commission has strongly recommended that striking KTX women workers be granted fair and just conditions of employment. The South Korean Minister of Labor, the legal community, various media outlets, 500 university professors, 300 members of the literary community and a wide cross section of NGOs including the Korea Women’s Association United, Lawyers for Democratic Society, People’s Solidarity for Participatory Democracy, Korea Women Workers Association United, and the People’s Coalition for Media Reform have also called upon KORAIL to reinstate the striking workers as directly hired employees, not as contingent workers contracted through a third party. However, KORAIL continues to disregard this overwhelming public outcry. KORAIL, the nation’s largest public enterprise and employer of over 30,000 people, refuses to abide by the most basic and fundamental standards of fairness and equality. KORAIL’s actions violate South Korean laws that prohibit all forms of discrimination, as well as international standards established by the ILO to protect the rights of workers. KORAIL is also failing to comply with the international standards that the company itself pledged to uphold when it joined the UN Global Compact in May 2007. The letter of the appeal is enclosed below. Dear friends, if you think that the cause of the KTX workers is worthy, I beg you to sign it and return with you sign to ktxworkers@gmail.com (please, indicate your position and affiliation). More info in Korean is available at: http://ktxworkers.blogsome.com. This thing is URGENT, since only the Almighty knows how long the hunger strikers will be physically able to hold on. This new work, a surprisingly detailed and professionally written account for somebody who is seemingly neither a historian nor a specialist in the field of agricultural economy, deals with the story of S. Korean rice agriculture, and mainly in 1960s-70s. The picture which emerges from reading it is helpful in understanding what is going on in North Korea in a sort of wider historical perspective—you get to know that S. Korea achieved self-sufficiency in rice in 1976, when it harvested 36 million sŏk of rice, and that this achievement was, in fact, quite shaky. S. Korea had to resume rice imports in 1980, when it harvested only 24 million sŏk due to a large-scale crop failure. It was happy enough to do so as it had enough currency at the time, and then became a stable client of the Californian rice cultivators – who were politically well-backed enough to press Chŏn’s dictatorship to buy their wares throughout the early 1980s, even when S.Korea did not really need them. N. Korea, with its depleted foreign exchange reserves and without cheap Soviet fuel and fertilizer, did not manage in the mid-1990s to escape the same plight which Southerners barely escaped in 1980. The way to rice self-sufficiency under Park was a bumpy one, and involved lots of disciplinary action taken in a good Japanese imperial spirit—of the kind the Western public would probably more readily associate with North Korea. It included designating special “no-rice days” (무미일 – no rice to be sold anywhere, and presumably no rice to be eaten in home dining-rooms, although this part probably was not really well-enforced), ordering in 1963 that all rice merchants to blend 20% non-rice cereals (잡곡) into their wares, and ordering restaurant owners to do the same with the rice they served. More resembling the good old imperial days—as well as the realities of the North Korean situation—were housewifes’ “public meetings for the sake of encouraging flour-based meals” (분식권장궐기대회), which were supposed to force home kitchens to comply with the governmental policy of “분식의 날”—bread and noodles only, none of that luxury good called ‘white rice.’ These housewives who were deplorably ignorant about the ways of making good food without rice, were taught to do so in special “flour-based meal consultation centres” (분식상담소), run from 10.00 to 16.00 every weekday by the “National Reconstruction Movement” (재건국민운동본부). And they had to study assiduously. If the share of white rice in the lunch boxes of their children exceeded prescribed norm, and this heinous crime was uncovered during the regular “lunch box checks” (도시락 검사), the punishment (that is, the corporal punishment for the children) would be severe, and their children’s grades for behaviour might suffer. This “rice economizing movement” (절미운동) ended only in the late 1970s—and the age in which newspapers explained that the high intelligence of Westerners was precisely thanks to the fact that they ate bread and not rice, became just an (unwelcome) part of the collective memory. It all shows something about the nature of post-colonial statehood on the Korean Peninsula – but the Western media did not try that much to poke fun at Park Chung Hee’s ways to discipline and punish his subjects, while very similar things (on a much worse scale, I have to acknowledge) done by Kim Il Sung, were always mocked in very good humour, were they not? I always wonder what proportion of Western—and non-Western—consumers of Samsung products are aware of what would happen to any Samsung employee who tried to unionize his/her company? There was a little bit more to this story, because the president’s own son, Park Ji-man, had smoked marijuana and been influenced by hippy culture. As the authors of the book point out, this was possibly further motivation for Park’s crackdown. Of course there exist semi-conspiracy theories as to why marijuana is prohibited throughout the world and how it came to be prohibited in the first place. We can also ask the broader questions about why states would want to outlaw commodities for which there is a clear market and which could be so lucrative to both capitalist entrepreneurs and government tax revenues (David Harvey has some good passages on the limits of commoditisation in his recent book on neoliberalism). This is probably not the place to get into all the historical reasons why this particular commodity happens to be prohibited. But the history of controlled drugs all over the world shows that social control is often one aspect in the calculations of governments enforcing prohibition laws. Korea was and continues to be a good example of this. The fact that illegal drug use is very low in Korea by world standards did not and does not stop the authorities from stamping down on the merest hint of usage, particularly when it comes to people in the public eye. As I’ve mentioned in a post before at my blog, there continue to be periodic scandals with prominent Korean entertainers being busted and sometimes having their careers ruined. And this is not confined to the world of pop singers or TV hosts – one of Korea’s most talented traditional musicians, percussionist and dancer Yi Kwangsu, has been in and out of jail a number of times as a result of his fondness for the odd reefer. I thought I would revive this title once more and add another post to the series on recent historiographical clashes in South Korea since I recently came across another interesting example that actually fits rather nicely with some of the posts made here by Jiyul and Noja. I came across this report on a debate on the Park Chung-hee era between Im Chi-hyŏn and Cho Hŭi-yŏn in the pages of the Donga Ilbo newspaper. Apparently the debate between the two has been going on since 2004, particularly in the pages of the journal Historical Criticism (역사비평) and the Professors’ Newspaper (교수신문). Going a bit further, Cho argues that both Im Chi-hyŏn’s views and those of Yi Yŏng-hun (who edited two recent books I’ve mentioned here: 해방 전후사의 재인식 and 수량경제사로 다시 본 조선후기) are part of a general attempt to create a revisionist history that takes advantage of the current crisis of ‘democratic progressive discourse’. He argues that while Yi’s critique comes from the viewpoint of the so-called ‘New Right’, Im’s comes from a postmodernist (탈근대적) position. Funnily enough I’m planning to translate a review of 해방 전후사의 재인식 by a Korean Marxist historian whom I rate highly, who makes almost exactly the same point, titling his review: ‘A reactionary duet between the right and the postmodernists.’ When I actually have some time to do the translation I’ll be sure to make it available to readers here. More on the debate here at the Chosun Ilbo. And something in English I found here on Im’s theory of mass dictatorship.